America has the highest corporate tax rate in the industrialized world: 35 percent, compared with an average of 23 percent for our industrialized competitors.2 Reform is becoming increasingly urgent. Corporate profits are taxed three times, once at the business level, another time when they are distributed to individuals, and a third time at death. The high corporate tax discourages investment. The gap between American and foreign rates is widening, as foreign countries are lowering their rates as the U.S. rate stays the same. In order to raise U.S. levels of investment, the corporate tax rate should be reduced to the range of 15 percent to 20 percent. America raised $343 billion from the corporate tax in 2013, according to the Office of Management and Budget, just 11 percent of all revenue, and the tax costs millions to administer.3 Most important, it effectively discourages investment in the United States. The high corporate tax rate results in double taxation of income for equity. When corporations take on debt in order to increase investment, the interest on the loan is tax-deductible. This is not true for equity financing. The returns to equity financing are taxed three times. They are taxed once at the corporate level through the corporate tax, once at the individual level, through individual taxes on dividends and capital gains, and once at death, through estate and inheritance taxes. After all these taxes are taken into account, the tax rate on equity can reach well over 50 percent, depending on the extent of the estate tax. This encourages firms to take on debt for financing, which is distortionary. Because U.S. corporations at a disadvantage when they operate abroad, high tax rates are driving American companies to become owned by foreign companies. For example, Burger King , the fast food chain, merged with Canada’s Tim Horton’s, a doughnut chain, in order to access Canada’s lower taxes. The last major revision of the tax code occurred in 1986, and some of those reforms have been undone by rate increases. 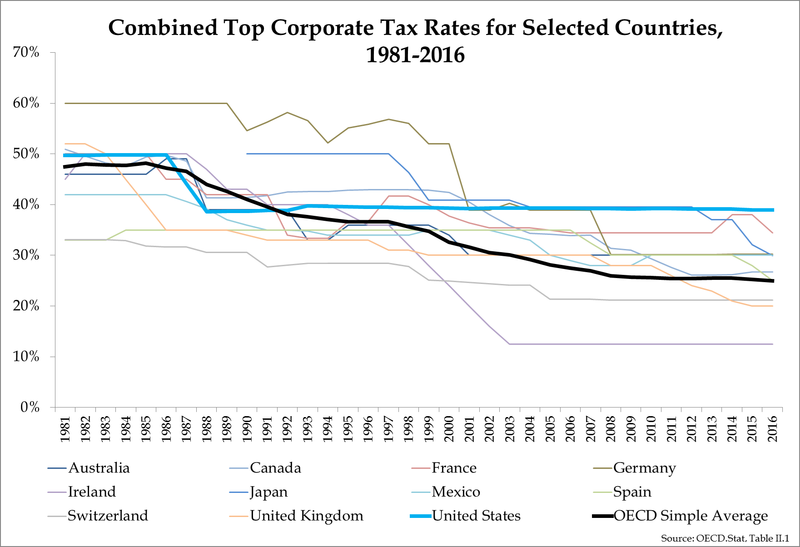 In order to increase international competitiveness and increase economic growth, America should lower corporate taxes and switch to a territorial tax system. Not only is the U.S. corporate tax an outlier, but U.S. corporations are taxed on their worldwide income—a path taken by only 7 of the 34 Organization for Economic Cooperation and Development countries (including the U.S.).5 This places America at a competitive disadvantage. A global (or worldwide) tax system is uncompetitive with high tax rates because it imposes a high income tax rate on all profits, regardless of where they are earned. If an American company operates in the United States and Switzerland, its domestic affiliate pays U.S. taxes of 35 percent and its foreign affiliate pays U.S. taxes at 35 percent and Swiss taxes at 21 percent. America allows companies to deduct the taxes paid to foreign governments from U.S. taxes owed to the Internal Revenue Service, but this means that corporations always pay the full U.S. rate and are unable to take advantage of low-tax jurisdictions. In contrast, a territorial tax system, common to most of our competitors, taxes only the income earned domestically. Our American company operating in Switzerland and America would pay U.S. taxes on its domestic income and Swiss taxes on its Swiss income. In this way companies can take advantage of low-tax jurisdictions. Business decisions can be made more efficiently, since bringing profits back domestically will not result in those profits being taxed again – thus, capital can go where it is most needed. American companies hold offshore about $2.6 trillion of earnings from foreign operations.6 No one knows how much would be repatriated with a lower U.S. tax, but any increase would add to investment and employment. These are funds that, given proper incentive, can return to America and be used for capital projects, dividends/share repurchases, consumption, or job creation – all of which represent a boost to the weak economy. Under the status quo, firms have every incentive to keep profits abroad and little incentive to repatriate earnings.11 A lower rate of corporate tax would mitigate the effect of any of these incentives, allowing for a more efficient distribution of capital. As an added benefit, the economically inefficient expenses that businesses incur trying to avoid taxes would drop significantly. The plan allows full expensing for investments in both tangible and intangible assets, which would result in a zero tax rate on new investment. Foreign subsidiaries would receive a 100% exemption from taxes on dividends. Upon repatriation, accumulated foreign earnings would face an 8.75% tax on cash or cash equivalents and a 3.5% tax on other forms of accumulated foreign earnings. The bulk of complex subpart F rules would be eliminated. Ryan proposes a move to a territorial tax system and a system of border adjustability. This means that exports would be encouraged and imports would be penalized. Currently, a business that imports an input for its production process can deduct the cost of that input. Under border adjustability, this deduction would no longer be allowed. The combination of tax incentives created by the corporate tax plan and border adjustability would attract some of the $2.6 trillion in offshore earnings back into the United States, which would create a stimulus to the U.S economy. The United States now has an export penalty and import subsidy. The Ryan tax proposal flips this to produce an export incentive and import penalty because of its destination-based tax and territorial system. It would end the problem of inversions, which are partly caused by trapped cash overseas and U.S. rates that are higher than those in other countries. Border adjustability is the concept of specifying the parameters for choosing where goods are taxed. Under border adjustability, taxes are either “destination-based” or “origin-based.” Currently, most countries—but not the United States—use destination-based methods to impose taxes because the OECD guidelines suggest that all VATs be applied on a “destination based” principle. This makes sure that goods and services are not taxed twice, nor are tax free: if one country had origin-based taxes and another had destination-based taxes, then companies would be taxed twice when trading between the two jurisdictions. In practice, the border-adjustable VAT tax offers rebates to companies exporting goods so that the tax system incentivizes businesses to export rather than creating disincentives. Of course, U.S. exports would still be subject to destination-based VATs in other countries. Taxes are also levied on imports from foreign countries at the same rate as American goods would be taxed abroad. For instance, a 10% tax on T-shirts in the United States would mean a 10% import tax on T-shirts imported from Brussels to the United States. This intends to “level the playing field” between products from different countries, so that domestic taxes within a country do not disadvantage its producers disproportionately in relation to foreign producers of similar goods. Border adjustability taxes are essentially tariffs under another name. They incentivize exports and punish countries that do not tax their goods at the same rate as the home country by eliminating their “unfair” competitive advantage. The reason that they do not harm trade like a conventional tariff is because the tax rate at each destination is the same for domestic and foreign goods - thus OECD refers to it as a “neutral” policy. With freely floating exchange rates, a new border adjustment tax on a country simply makes it adjust the value of its currency, says Viard. In Viard’s example, if the United States imposed a 20% adjustment tax on another country that was pegged at 10 of their currency to one US dollar, the other country would simply re-peg its currency to 12:1. This would maintain the exact same relationship between the currencies and therefore the relative prices in the two markets. Viard suggests that even if the other country did not re-peg, the prices in that country would gradually fall until the effect was the same. However, many factors other than taxes determine a currency’s value. Currency values do not move directly with taxes. One question that arises is whether border adjustability is legal under World Trade Organization regulations. It is clear that waiving the tax on exports is legal, but what about disallowing a tax on imports? However, other countries use the same system with their value-added taxes. Under many forms of VATs, taxes are refunded when products are exported, and are imposed on imports. This is not the case under the current U.S. corporate tax system. In fact, the United States now has the reverse: exports bear the cost of the U.S. income tax and imports do not get taxed. This is a penalty on exports and a subsidy to imports. Ryan’s corporate tax plan would reverse this. The Ryan plan could help stem the declining support for free trade. Many other countries have indirect taxes such as value-added taxes that are refunded on exports and levied on imports. Now, unlike companies in most other countries, American companies pay less tax when they import than when they export. WTO rules prohibit the direct corporate income tax from being refunded on exports or levied on imports. Ryan’s plan would reverse this subsidy to imports and penalty on exports. The current system puts American companies at a disadvantage relative to those in other countries, which explains the rash of inversions and the efforts of the U.S. Treasury to stop them. Ryan’s plan would not only repair the broken corporate tax code but eliminate the trade bias—which has led more Americans of both parties to support reducing free trade. The burden of the extra corporate tax falls on both American capital and labor. No wonder Americans feel abused and disadvantaged. The combination of a territorial system, full expensing of capital investments, and border adjustability would help to restore the trade balance and stimulate GDP growth. It is clear that the corporate tax code could be far more supportive of U.S. domestic growth than it is at present. The U.S. corporate tax system disadvantages domestic manufacturing in favor of foreign manufacturing. With a 1 percent GDP growth rate, it is time for change.